Famitsu interviews Nomura on KINGDOM HEARTS 3: Toy Story, battle system & more! 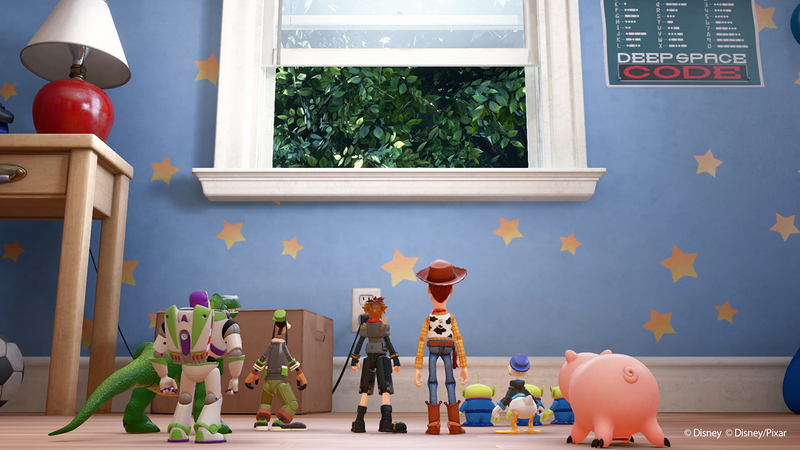 Famitsu had the opportunity to interview Tetsuya Nomura at D23 Expo and asked about the newly revealed Toy Story world, battle systems, and general story. The complete issue will be released at a later date, but leaks have surfaced via Hachima. Regarding specifics about when exactly in 2018 KH3 will release, Nomura would like fans to be patient for future news. Regarding the phrase that appeared in both the D23 and orchestra trailers, Nomura added it into each trailer after editing had already finished. He wanted it to specifically end in the words “dive in”, so as to return to the original concept of the Kingdom Hearts series. Nomura has wanted to add in a Toy Story world from as early as the development of KH2, so he feels tremendous emotion toward it. This time, like they had done in KH1, there have been loads of negotiations between all related parties to create worlds. When Chief creative officer of Pixar, John Lasseter came to Japan and Nomura met with him, John would often voice his opinion on things he wanted Nomura to add in. The Toy Story world will not just rip off a small part of the original story in Toy Story, instead it will take place in a time after the end of the 2nd film, and all events that occur will exist on that same time line. It’s not in the trailer, but there are times where Rex mistakes Sora for a toy of a game character that’s up for sale in the Toy Story world. Regarding designs for Sora, Donald and Goofy, much back and forth action between the art directors and Pixar took place. Initially, the designs were much closer to that of action figures, but after much consultation, they became as they are. Pixar wanted the designs to fit closely in line with the Toy Story world, and so both parties worked together to reach a satisfactory conclusion. Nomura comments that even Pixar staff themselves were surprised at how close the graphic quality is to their original work. Every world has their own look and feel, so it’s almost like designing a whole new game with each world. Nomura comments that it’s tough work. The Toy Story world has been in a pretty showable state from a while back, however due to different ideas and advertising plans, Nomura left it under the wraps. Nomura wanted to show a bit of Big Hero 6 in video form this time, however was not able to. Last time, he could only show one piece of art because it was an urgent and sudden request. This time, however, he couldn’t because Big Hero 6 was one of the later worlds that had been decided to be included, so showing it off will have to wait a little longer. Regarding the battle system, having many commands appear on the screen at once was something Nomura had always wanted to do for this system. Constantly having choices, and having the selectivity to assemble different combinations creates a very fun and tactical environment. It can look a little difficult at first, but Nomura wants fans to rest assured that even randomly selecting options can create some very flashy combinations. Depending on a Keyblade’s characteristics, they will be able to transform into several different forms. The feel of each will differ according to the world they were obtained in, but they can be used freely in any other world also. The Keyblade transformation ideas are all from the staff, and there’s ones that go even crazier than the drill transformation. The shield transformation from the Hercules world has become the “Guard Form”. Above becoming a powerful counter to gigantic enemies, it can also release brutal finishing attacks. There are strengths and weaknesses to each Keyblade, but this is necessary to maintain balance. When the required conditions have been satisfied, combination attacks with party members will be possible by a button press. Combinations with unique characters from respective worlds will also be possible. Regarding the organisation of parties, there’s a new system in place which will be introduced at a later date. Being able to jump into and control the robots in the Toy Story world was something the team had wanted to do from very early on, however there will also be other gimmicks. In the Toy Story world, the Toy Shop will be an important area, where you will be able to enjoy various other gimmicks by interacting with the toys that are available for sale. Even in following announcements, Nomura thinks fans will be surprised at the quality of content. The world in which younger versions of Eraqus and Xehanort have been seen to be playing chess in is actually a new world. In regards to the amount of worlds in KH3, it will be a little less than KH2, however the content available to play in each will be a lot richer. Story wise, there are a plenitude of characters, so the story will also be rich. Nomura comments that he can’t have everyone meet together and throw one liners at each other. Nomura comments that the problems that each character has shouldered must also be settled. This also includes the members of the former Organisation XIII. There will be another short break from KH3 news. In future announcements, Nomura intends to move forward with more specific details on systems like the battle and level up systems. It's funny, people complain about Kingdom Hearts III being delayed, but the positive of that meant that Big Hero 6 was able to make it into this game. And glad too see that former Organization members will serve as the key original characters for this installment outside of Lea. Can't wait to see what gets revealed next. Didnt he say less Disney worlds rather than less worlds in general? So Xehanort and Eraqus aren't playing chess in LoD? Interesting. Could the world be Cable Town? Each world will have its own unique transformation. What now? Each world? Didn't he say each Keyblade in the other interview?? The location where young Eraqus and Xehanort play chess is an original world. The story will be much deeper and darker than in previous installments. Former members of Organization XIII will be involved. Larxene and Demyx pls! Finger's crossed. Could have been a mistranslation. We don't know yet the exact wording yet as to whether it's all of KH2 or just Disney worlds. And muke, each keyblade is tied to a world pretty much so it's basically the same thing if it's not a mistranslation. That's definitely a mistranslation or something.Makes it seem you're locked using a certain Keyblade transformations in the world you got the Keyblade from. What I'm saying is, these are very early rough translations of the interview. We don't know yet if Nomura said there are less Disney worlds or less than the total KH2 worlds. We'll know in a bit what it is that he said. The interview technically just came out in Japan a couple hours ago. These bullet points of the interview have me ecstatic even more for this game. A darker story? Holy crap, yes please!! The world of Toy Story features an original scenario set after the events of Toy Story 2 and exists on the same timeline as the films. I'm sorry, did he just say KH is canonical to the film's continuity? I'm so glad that they finally give more depth to the worlds and try various things to make them lively. Something that was missing in KH2 and I absolutely missed the exploring aspect from KH1. Keep going, Nomura. You and Square will throw out something astounding to the gaming world, I'm certain of that. He did say that people can appreciate it as some kind of sequel, if memory serves me right. It literally says "Although the amount of worlds is less than KH2, the density is getting even deeper." Canonical in the context that it's based off the cinematic iteration of the Toy Story universe. It's not actually canon to Toy Story and Pixar's motion picture Universe. An example of a world that's not canon to the film's continuity is Enchanted Dominion. In Kingdom Hearts, Aqua battle alongside Prince Phillip against Maleficent, but she isn't killed. In the original feature film, Prince Phillip battles Maleficent and kills her off for good. From what I'm gathering, each Keyblade will have its own Transformation that's reminiscent of the world you got it from, not they'll have different transformations in each world, or won't transform at all. But I can see the possibility of the Kingdom Key being the only Keyblade able to transform in every world, while the world's exclusive Keychain can only transform in its respective world. That's because it retells the movie though, thus changing it. If KH III happens between two movies without impacting the following one, it can be canon to the the movieverse. It's still Disney property, and Disney actually intertwines things more often than it seems. Making it with Toy Story is actually easier, since you can put Zurg as a boss and make it so that it's just a different toy Zurg than the movie's one. The day that Sora or Kingdom Hearts is mentioned in a Toy Story feature film or short is the day it can be declared canon. As of now, Toy Story is no different from every other Disney world featured in Kingdom Hearts. Yeah, it's got a standalone story between the time period of Toy Story 2 and Toy Story 3, but it doesn't directly affect the original feature film franchise. Pixar themselves hasn't confirmed any inter-twining so it's preferable not to make a bold assumption like that. Did you not read the article? It clearly states the forms can be used freely in any other world to. Dude, when I posted that, the only thing that the post said about Keyblade transformations was what I quoted. It didn't say that they can be used freely in any other world. "Each world will have its own unique transformation", so of course I was confused. They edited the post with more information. The day that Sora or Kingdom Hearts is mentioned in a Toy Story feature film or short is the day it can be declared canon. It doesn't work like that. It's not about mentioning it in the product, it's about the people involved claiming it is. Yeah, it's got a standalone story between the time period of Toy Story 2 and Toy Story 3, but it doesn't directly affect the original feature film franchise. Yes, and that's exactly why it can be made canon. Because the movie still works without having plotholes due to the interference of Sora in a past episode. [*]The Toy Story world will not just rip off a small part of the original story in Toy Story, instead it will take place in a time after the end of the 2nd film, and all events that occur will exist on that same time line. This is less "being based of" and more "being a part of". It's literally saying that KH III's visit to this world it's in the movie's timeline. Ughhh.. Please just stop. Do we really need so many flashy things? Like, we get it, the game is flashy and you guys can do some great particle effectsâ€¦ but they almost think flashiness > anything else. I'm honestly a bit worried we're going to get a situation where the battling feels almost out of control because there are so many options and mix-and-match things. Like I get that transformations are cool but I would actually like to spend time hitting things with keyblades and not just having it automatically turn into two guns and then a giant drill once you get enough combos. I hope that all of it ends up being optional so you can choose when to do it. I'm honestly a bit worried we're going to get a situation where the battling feels almost out of control because there are so many options and mix-and-match things. Like I get that transformations are cool but I would actually like to spend time hitting things with keyblades and and not just having it automatically turn into two guns and then a giant drill once you get enough combos. I hope that all of it ends up being optional so you can choose when to do it. All of it is optional, so at least that's good. Hmm, so it`s a new world where Eraqus and Xehanort are playing chess? Sounds exciting. Nomura`s comments about the plot and how he has been thinking about it makes me hopeful that it will turn out all right. What you're describing is endorsed fan-fiction. Here's the definition of canon. "The works of a particular author or artist that are recognized as genuine". Again, Pixar not Disney have confirmed this, and even with Nomura's quote, he didn't even say that it's canon to the Toy Story franchise, just that the Toy Story represented in the game is the same Toy Story from the feature films. You can literally use that response as the logic for other Disney worlds Sora, Donald and Goofy have visited, and claim that they're canon to the feature film franchise. Nomura: "Toy Story world takes place after Toy Story 2, is not an alternate or parallel world. Story is canon in the Toy Story universe." This is exactly my problem with KH3 right now. Them saying "It may look difficult" has me even more worried, because to me it looks too simple. It looks like all form of strategy the KH games have had have been thrown out the window in exchange for flashy looking moves. This makes it MORE of a button masher imo. What's worse is Sora's combos don't look right to me, and I have a feeling those are the only combos hes got at his disposal because all the cool moves were put into these transformations. I really don't like that because I prefer using the actual KEYBLADE, not some other weapon. Hopefully drive forms are more advanced than they are letting on. It also kinda makes me worry that we wont even have an abilities tab in the menu at all. I am starting to think the situation commands are just going to be that quick to activate from the getgo, and that we wont have abilities to improve Sora's combos, he is just going to have those naturally. It is all about the flashiness for Osaka. Also great we have these giant worlds with more "to do", but without any NPC's they're still going to feel kind of empty. I honestly don't get the switch from having "save point rooms" to "save point will appear once you have beaten all the enemies". That makes it frustrating if you just want to save the game right away, and makes it harder to put in NPC's. Still sad to see the chariot dropped for a shield. Small break from news probably means skipping TGS. What you're describing is endorsed fan-fiction. Trust me, I write fanfictions. Here's the definition of canon. "The works of a particular author or artist that are recognized as genuine". So it's pretty much what it's been said. Can I notice that it doesn't say "by the original author", and that "genuine" is a really broad term? Again: don't just put blind faith in one sentence definitions. Reality is never that simple. I don't think confirming this is Pixar nor Disney's job. Is definitely something Nomura should confirm, he definitely speaks on their behalf as well or else he won't have permission to say anything at all. and even with Nomura's quote, he didn't even say that it's canon to the Toy Story franchise, just that the Toy Story represented in the game is the same Toy Story from the feature films. Dude... it literally means that is canon. See, this is a pretty clear definition of canon. The Toy Story shown in KH III and its events are set in the same timeline as the Toy Story movies, aka the franchise. It really doesn't get much simpler than this. Canon. I totally cannot, for claiming KH II Beast's Castle is canon to the franchise would be wrong on so many levels. I wonder if Nomura's comment on "former Organization XIII members" also refers to Demyx, Luxord, Marluxia and Larxene? Other than that, this is great and insightful news. The hype train keeps going! If you guys honestly want to believe that then go right ahead. Just prepare to be dissapointed if Nomura has to make a clarification on that particular statement. Nomura did hint at Marluxia's involvement in The Kingdom of Corona so I think it's a given at this point. When the required conditions have been satisfied, combination attacks with party members will be possible by a button press. Aaaaaand Limits are ALSO Situation Commands. Why even have an MP and Focus bar at this point? Just make EVERYTHING a SC. Right? I swear, I don't like where this is going. Chariot is most likely a secondary transformation for the Olympus key, like the drill is a secondary transformation for the hammer. I have a hard time seeing how the Chariot could work from a regular gameplay standpoint. Uhâ€¦ of course I'm gonna complain? Like, yeah, it's not out yet, and I haven't played it, but I can still voice my complaints, can't I? I saw how it works, and I read how it works. I might as well say "yeah, the game looks beautiful, the graphics are just incredibleâ€¦ we've seen it in all the trailers, but let's play it first before we judge and post just how beautiful the game looks", same thing. And I mean, yeah, we do know how it works, thanks to 0.2? Youâ€¦ you literally just do some combos (varying specific things) in order to unlock Situation Commands, which is how 75% of the game's mechanics are activated. ^ God, I really hope so. I agree with some people above, I do think the Keyblade Transformations / Drive Forms / Attraction Flow Rides are a bit much....I hope that normal combat with the Keyblade isn't too uncommon within regular battle just because it can get a little too flashy. I do imagine we'll have less options during boss battles except some situational reaction commands. I just hope it isn't too overdone. As for the "Number of Worlds" thing....I do get what they're saying about putting more effort into quality worlds and their stories. I am a little bummed that we'll get less than in KH2, but I'm sure the worlds' individual stories will have really great significance within the overall plot and the worlds will be extremely expansive. KH2 had (iirc) 16 playable worlds. They did use the term "a little less" worlds, so I'm hoping for at LEAST 10 in KH3. So I'm making a (realistic) hope that we maybe get 3 new Disney worlds and then maybe TWTNW (or another original world) for a complete 10. I hope that means the "I kind of had you murdered in cold blood" issue with Ienzo/Zexion and Lea/Axel gets settled, I was disappointed that the whole topic got brushed aside in DDD. Zexion's "death" in CoM was pretty brutal imo. ^ Same here! They could definitely be fleshed out more. Demyx and Luxord always felt like they were just there to fill in the seats. Normally I'd retort with "If we complain now, they'll have time to fix it", but I doubt they're even interested in what a small amount of detractors have to say. They'll do what they think is right and we'll just have to deal with it. Oh, Frozen is definitely happening. No doubt they won't want to promote the game with arguably the biggest animated Disney film of this decade. Gonna be honest here guys. Less worlds disney or not, combat looks horrendous, any sense of fun gameplay has been swapped for flashy and slow moves. It's too the point where I actually want dlc just so they can fix all this stuff, add worlds etc. You can't swap keyblades at will, you have to swap keyblades in order to go into different forms, everything is tied to situation commands. I wouldn't be surprised if they completely got rid of abilities in general, hell I wouldn't be surprised if jiminy's journal and leveling up has been completely removed. I know it's still in development. I know anything can change. I know i'm overreacting. Iv'e seen series i love die and i'm afraid it's happening again. The only thing that looks fun is exploring the worlds now. I have to agree with a lot of you in here, it does look like there won't actually much fighting with the key blade and that does seem disappointing but to be honest, we're only seeing trailers, so they are showing the most flashy and vivid parts. I'm sure that you'll be able to choose if you want to use these abilities or not. Like most of you have said, I hope that they don't over do it. My biggest worry is actually that there will be all these options, but only like two will be even remotely viable in boss fights. Like BBS, where the hardest to get commands will basically only get you killed against the final bosses. I'm worried the original worlds won't be expanded. Twilight Town for example looks as small as in KHII. We didn't see the new areas of Traverse Town for DDD immediately, if I remember correctly, so I think it's safe to guess the town will probably be expanded in some manner. My heart sank a little when I read that there would be a little less Disney worlds than the ones in KH2, but as long as it's close to 13 (like around 9 or 10 at least) I think i'll be fine. The worlds are so large and dense this time around that it'll more than make up for the smaller amount. The combat/abilities stuff does worry me a little bit too, but I think it'll be fine. Hopefully there isn't a huge break until the next information dump, because I do want more clarification on how abilities and leveling up will work. 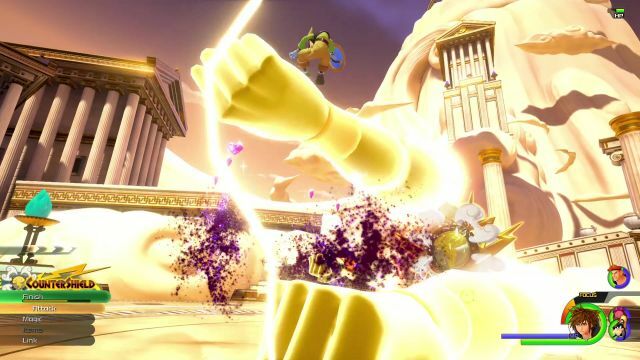 Aren't the giant fists the second form? I watched an analysis video where they thought the giant fists were a counter command. I think the command changed to counter and everything. So yeah I think the second form's finisher could be the chariot? Like how the finisher for the Drill is really the Claw. I guess I also seem to think there will be more returning worlds than others seem to think? Though who the heck knows right now lol. I just want 9 to 10 Disney worlds at least at this point. And no, they are not. Apparently, Big Hero 6 was the last world to be included in KH3, is that true? Or was that a mistranslation? Nomura comments that he canâ€™t have everyone meet together and throw one liners at each other. Story updates for KHUX arrive on the second Thursday (JST) of each month, so if they follow that schedule, it'd be August 10th. It'd be kind of cool if it was. Also, it wouldn't really matter to the film series since whatever happens here would have happened 10 years before Toy Story 3, so it's not really an issue. Hmm, I am a bit torn up at how Kingdom Hearts III will have fewer worlds than Kingdom Hearts II but if they are as rich as Nomura says then perhaps it will be just fine. I just hope that it isn't like 7 or 8 worlds overall. I also hope that much like KHII you get to visit the world twice rather than just once. I haven't seen the Colosseum in KHIII yet, although we have seen the world a lot I would have liked to have seen the Colosseum itself. I really want Tournaments to return. I just don't want to finish this title in 15 hours I think that's my biggest fear. I am really excited for KHIII and I can't wait to see more about the levelling system! !